That’s when Stephanie Murdock enters. She established the Skatepark of Baltimore, a grassroots 501c3 non-profit organization whose members want a public skate park built in Baltimore City. The site chosen for this destination skate park is currently Roosevelt Park, at West 36th Street and Falls Road. Because of a January 2008 YouTube video where a Baltimore City police officer approaches a group of teenagers that have been skateboarding in the Inner Harbor, which is not allowed turned sour, that reached "a turning point". That’s what Stephanie Murdock says. And she adds "If those kids had a place to go, the officer would have had no one to confront." Building a skate park costs much less than constructing a recreational center for a community. Even though $200,000 dog parks are being built in the city, the skate park is getting little attention or funding. There are an estimated 30,000 skateboarders in Baltimore City with few, if any, areas in their community dedicated to the sport. 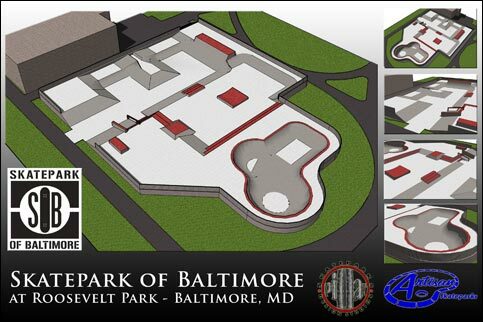 The cost for the Baltimore skatepark is estimated at $500,000. To date, the cause has received support from several of the skate industry's heavy hitters including Zoo York, Nike, Vans, Element, Dakine, Quiksilver, Fuel TV, and Alli Sports. Murdock has previously estimated Baltimore's skater population to be slightly over 29,000, which cannot be properly accommodated in any current skatepark. Murdock is involved in every aspect of the skate park creation, in addition to running after-school programs and working on fundraising ideas. She said she had worked with six different directors of the Department of Recreation and Parks of Baltimore City during the past five years. She said it was time consuming to re-introduce the project to each new director, but this had not stopped or slowed the work ethic of Murdock or her organization.